A pro compression girdle with HexPads™ protecting the hips and tail bone. 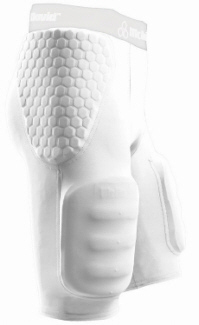 The #755 HexPads™ Girdle is commonly used to replace the old fashioned girdle and hip and tail bone pads in football. 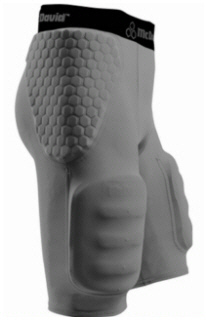 Includes pockets for thigh pads (pads not included). It conforms to and stretches with your body for continuous protection. Our Ultra hDc™ Moisture Management Technology enhances heat control, comfort and performance; and it won't wash out. Compression fabric acts as a second skin to support large muscle groups to help reduce pulls and fatigue. Provides relief from chafing and skin irritation. Colors Available: White, Black, and Grey.